I have AT LAST come for your feels, my darlings. This one ran away from me. This first part of this is a tribute to… well, I guess on the true story of SummerLightning and her brother Pup! (I hope they don’t mind.) You can read it here. 2017. Pentalic Illustrator’s Sketchbook paper; Prismacolor Col-Erase pencil; Adobe Photoshop CS6; Surface Pro 3; Wacom Cintiq 22HD; Originals are 2339 x 1956 px. She’s five and standing in the middle of stones that all have her name on it. “Holtzmann” on grey and bone-white rectangles, jutting up from the ground in rows like morbid teeth. She doesn’t remember whose grave her mother came to place flowers in front of – it doesn’t matter to her – what matters is that they’re here and she’s BORED. So she wanders. She walks and runs her hands along the smooth stones, looks at the birth dates and reads the bits of the little messages that she can understand (it’s most of them). One has her birthday. Different year. Huh. Cool. She keeps walking. Then she stops. She stares at the stone that bears her EXACT birthday like fangs. Day, month and year. Holtzmann. Born and died the same day. Her birthday. “Mom?” Jillian calls, concern prickling in her voice. Her mother looks up with tired eyes. She pads over softly and sighs when she sees what has Jillian wide-eyed and anxious. “Your sister,” she says flatly like she’d been expecting this, but is still too tired to deal with it. Her mother rummages in her purse and pulls out a picture in her wallet and hands it to Jillian. It’s a picture of two babies. One is bright and blonde and pink. One is dull and hairless and almost grey. Jillian stares first at the picture and then back at her mother. “She didn’t… make it,” her mother says like the words are stuck between her throat and her tongue. “Oh,” Jillian says, a bit confused. She’s a smart five year old, but there’s only so much you can understand at five. Her mother kneels down, holds her and sings softly. Jillian doesn’t remember where she’s heard the song before. Holtzmann is soaked through by the rain, hair utterly wild and voice clean and crisp over the commotion. Erin is charmed by the image. “Erin! Now!” Yells Holtzmann and Erin opens the ghost trap one last time for the day. They’re in an alleyway behind a cat rescue, Whiskers R’ We, and on very loud insistence from Holtz, they aren’t allowed to obliterate any of the ten ghost cats that are haunting the establishment. They theorized that the constant week of rain brought them out of dormancy; even ghost cats hate water. They now have ten ghost cats. “You should consider adopting a live one!” Barbara, the manager of Whiskers R’ We insists. They’ve made the mistake of coming back inside the cat rescue to towel off a bit before heading home. “Holtz, no, Abby’s allergic,” Erin sighs. “We don’t live with Abby,” Holtz wiggles her eyebrows. Just then, Veronica, who earlier insisted on being called Purronica (“like how a cat would say it”) walks up and puts an arm around Barbara, “Don’t hassle the nice ladies after they finally took Pearl, or I’ll have to give you a little pinch.” She holds her hand in a pinching motion way too close to Barbara’s chest. “Not in front of the Ghostbusters,” Barbara mumbles as she pushes the other woman away playfully. “You like it,” Veronica quite literally purrs. “That could be us, but you playing,” Holtz whispers to Erin. Patty hears this commentary and snickers. “Oh or take Hallelujah! Big Leonard Cohen fan,” Barbara points to an orange cat that instantly curls around Holtz’ leg as if summoned. The two cat ladies wave them off as the Ghostbusters beat a hasty retreat back to the car. Erin hops in the passenger’s side next to Holtz at the wheel, as always. Holtz seems to snap out of her daze. “Absolutely perfect, babe,” Holtz says with sickening cheer in her voice. She squeezes Erin’s hand too hard. Erin tries to unpack that as she lets Holtz simmer for a bit, but after an hour of silence (no music, no banging, nothing), she heads upstairs with a peace offering. Holtz puts down her tools, hops off her stool and throws herself into Erin’s arms. Erin holds her for as long as she needs. “I know how much pizza rolls cheers you up, since you’re – y’know – twelve, ” Erin teases when Holtz releases her grip. “Cara mia! Je t’aime,” Holtz exclaims, and with a flurry of kisses to Erin, Holtz seems to return back to her normal self. 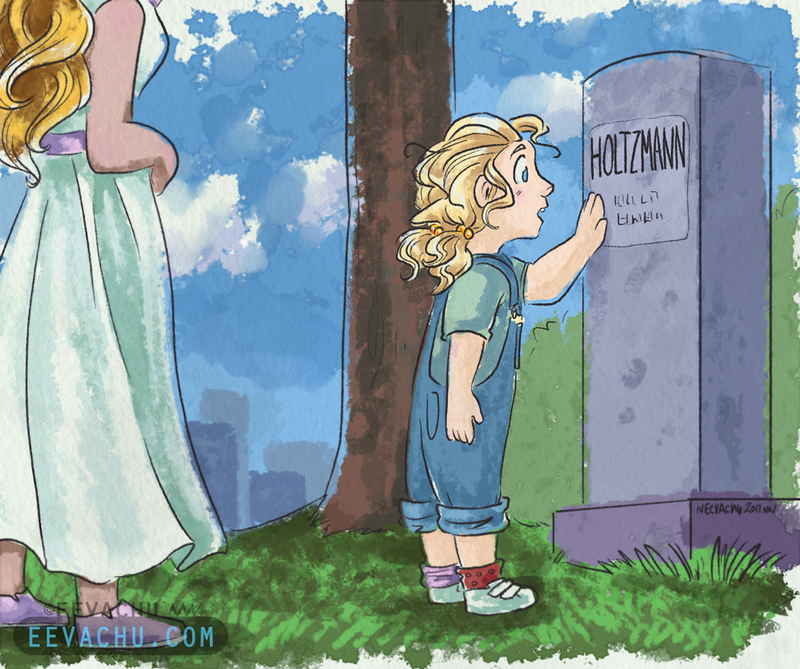 “Why doesn’t she have a name?” Says a little Jillian, not quite as little as the first time she ran her hands across her sister’s tombstone, but still little. “I thought it would hurt less,” her mother says after a moment. Her mother smiles that smile she gets when she doesn’t understand Jillian, but knows her daughter is doing something right. She ruffles her hair and Jillian grins. Her mother shakes her head, but pats her knee and Jillian scrambles up onto her lap. Her mother wraps her arms around Jillian and teaches her the words. Something is still off. Not by much, but something is still off. Holtz is a little quieter, a little more careful, holds Erin a little longer and squeezes a bit too tight. Erin is there for her, tries to ask her what’s wrong, but worries that she’s the thing that’s wrong. She squeezes Holtz back harder and says nothing. “No buts,” Abby interrupts and shoves her in the direction of the second floor lab. Erin watches her go, then makes her way upstairs. She’s greeted by soft piano music, the type she only hears on occasion; the occasion usually being Holtz is upset someone got hurt. Erin’s heart fills with dread. Erin recognizes the song, it’s a classic, but she’s never heard this version of it. She understands why when she sees Holtz in front of a beaten up electric keyboard, eyes closed, fingers gliding over keys and singing. Erin’s heard her sing plenty of times, but never like this. It’s earnest. It’s pained. Holtz doesn’t finish the song, she trails off and lets her head fall forward. “That was beautiful,” Erin whispers. Holtz snaps her head up in surprise at Erin’s voice. “Honey, what’s wrong?” Erin moves to her, but Holtz stands abruptly, knocking the chair out from under her. “I’m sorry, I can’t,” Holtz pushes her away and bolts out of the door. Jillian, lanky, frizzy, not little Jillian flails wildly about as she talks about her new favourite teacher. Her new favourite person besides her mother and Cat, really. Her mother sits on a bench behind her. She’s smiling and wearing that floral sundress that her daughter bought her for her birthday. Jillian is starting notice how her mother looks older, how she had to take two breaks on the walk here, how the trees they sit under in the cemetery seem taller. Jillian loses the thought as she bounds over and sits, swinging her legs back and forth excitedly. “Aren’t you a bit old for a sad little lullaby?” Her mother teases. “Pleeeeease? Cat would like it.” Her mother doesn’t sing much anymore, and she feels bad using Cat as leverage, but she thinks it helps her mother too. Her mother smiles and sings, and Jillian hums along. Holtz doesn’t come back to the lab. Holtz doesn’t come home at all. Erin knows this because she waits all night. “She texted me that she’s okay. She’s an idiot and she’s sorry, but she’s okay,” Abby assures her that evening over the phone. Erin is absolutely manic by the time she stumbles into the firehouse. Obviously, no work is getting done today. Patty senses she should probably leave Abby to deal with this on her own and takes her lunch early. She drags Kevin out to get these dramatic idiots some comfort food. “She ran out of here before I could ask!” Erin tells a little bit louder than she intends. “She’s probably just embarrassed about you catching her singing that song,” Abby laughs halfheartedly, convincing no one. “That song. What the hell is up with that song. Abby, what do you know?” Erin turns all her manic intensity on Abby and it’s kind of terrifying. “It’s not my place to say,” Abby sighs. “Okay! Okay!” Abby acquiesces, throwing both hands up in surrender. It’s raining, because of course it is. Jillian sits on the muddy earth anyways. The mud under her is fresh. The service had been hours ago. Only friends, but lots of them. She runs her hand across the newest bone white tooth in the Holtzmann mouth. “Beloved mother” it reads, and it’s very right. It’s not like it came as a surprise, but it still hurts. It’s hurt for the months she spent by her mother’s bedside, for the years she watched her mother getting weaker and there was nothing she could do to stop the eventuality. She knows it’s never going to stop hurting. She flops backwards onto her back. Her head lands on a familiar plot of soil. She stares up at it, runs her hands across it, and traces the name, half engraved and half scratched in one night by a drunk twenty-something who just blew her shot at CERN. Holtz remembers what her mother had said to her when Holtz had told her about the accident: I’m not giving up and neither should you. She stares up into the rain and finally let’s herself cry. The tombstone doesn’t answer. None of the tombstones do. So she sings to herself between sobs. Her mother’s lullaby, her sister’s lullaby, her’s too. She gives up on being Jillian. She tells people to call her Holtzmann after that. She’s the only one left, after all. Erin walks up the hill in the direction the groundskeeper points her in. The cemetery is old and well-maintained. Fresh cut grass and even fresher cut flowers; ancient trees and crypts. It’s not too far out of the city, which makes it all the more impressive. Erin stops when she sees the first Holtzmann stone, and she looks down the row at the rest. It’s a surreal feeling, seeing so many in one place. She continues on until she sees a shock of blonde hair. She almost cries in relief. Holtz is sitting with her back against a tombstone, intently pruning single blades of grass up and pulling them apart. “Abby’s a terrible liar, huh?” Holtz says without looking up. Erin sits down in front of her. “That… that you wouldn’t like me anymore,” Holtz says as she finally looks up. “Why would I think that?” Erin laughs and Holtz winces. Erin scooches closer, close enough to take both of Holtz’ hands in her own. She rubs her thumbs in circles on the back of her girlfriend’s hands. Holtz just about melts into the touch. “Holtz. I want to know all of you, not just the fun parts. I wish you’d tell me things; I thought all this was you breaking up with me!” Erin laughs, a bit too manically for it to be a joke. “How could you ever think I was breaking up with you?” Holtz says with a tone that one would ask about person’s belief in a flat Earth. She turns her hands slightly and laces their fingers together. “I don’t want to drive you away,” Holtz deflects. Erin leans her forehead against Holtz’. “Holtz, I love you, you aren’t going to drive me away that easy,” she says softly. Holtz is silent for a long moment. “All of this is too hard,” she says finally. Holtz casts her eyes downward. Erin sighs. Until Erin pulls her in against her chest. Clings to her. Kisses her everywhere she can reach. Whispers softly to her. Holtz buries herself in Erin’s grounding touch. She’s here again. She’s here. She’s here. And she hurts. God, does she ever hurt. And that’s okay. She loses track of time. Of space. Of everything. “You okay?” Erin asks when she feels the tremors abate. “Is it because of that song?” Erin asks. “Huh?” Holtz asks, still in a daze. 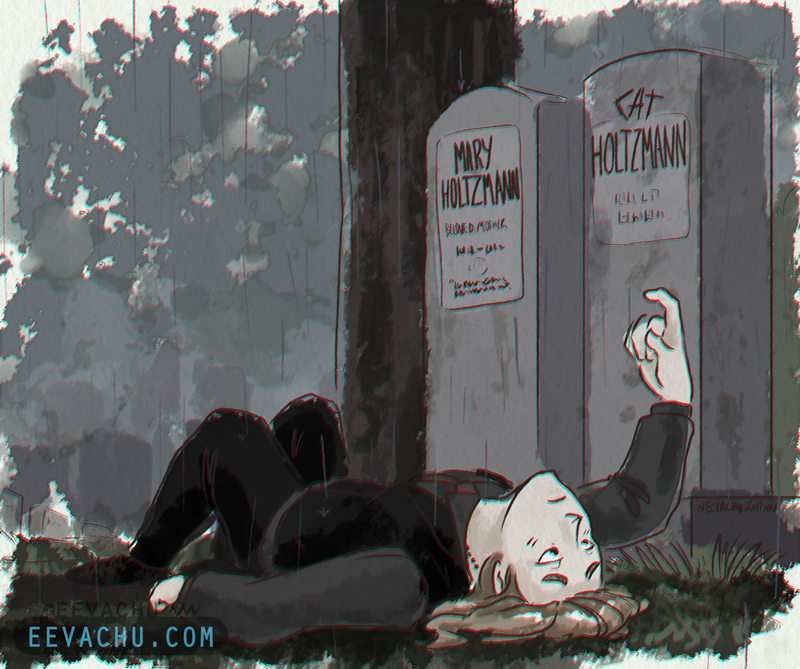 Holtz pats the tombstone behind her and Erin’s eyes go wide. Holtz laughs at her goggle-eyed girlfriend, “It’s okay, I never knew her when she was alive. Mom said she only lived a few hours. I was the stronger one of the two and I guess the world couldn’t handle both of us. Mom used to sing ‘Hallelujah’ to us when she was pregnant. I didn’t find out about my sister until I was five. Until I saw this tombstone, actually.” Holtz stops and looks at Erin, who has been watching her with wrapt attention. She mistakes it for boredom or rejection or the myriad of things that it always is. “I’m sorry, you probably don’t want to hear this,” Holtz chuckles, trying to ease out of the situation like she always does. She fidgets with the grass again, unsure. Holtz seems to light up at that line of inquiry. And Holtz tells her everything she can think to tell her. About Cat. About her mom. About herself. And Erin tells her things back; she tells her things she’s never said out loud. They stay like that until the sun becomes too bright and the day too nice to sit on her sister’s grave. “Can we go home? Go to sleep?” Holtz asks quietly. Erin stands and pulls her up by the hand. Holtz doesn’t let go. They walk back down the pathway hand in hand. 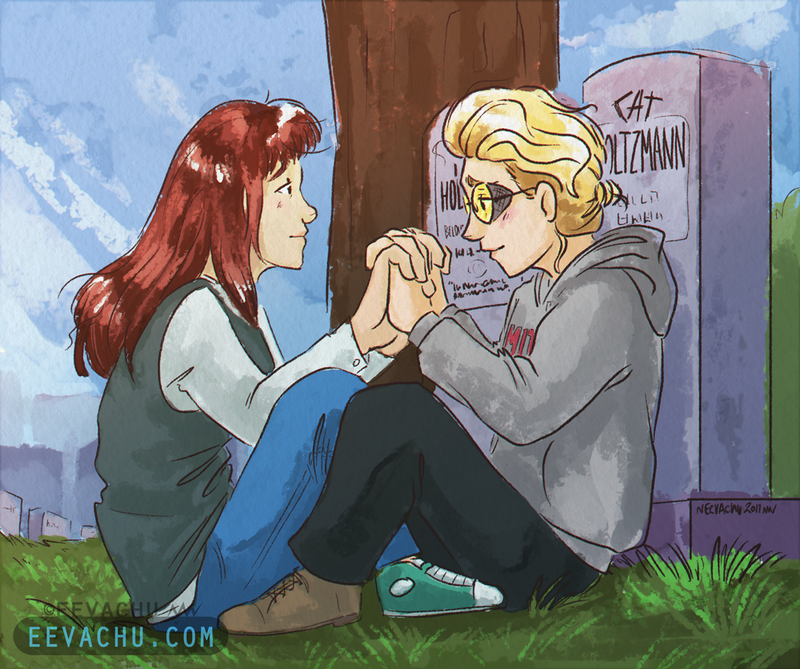 Holtz trails her other hand across the faces of the Holtzmann tombstones, her face unreadable. Erin bites her lip as she watches. “You don’t have to be the last Holtzmann, you know,” Erin blurts suddenly. Holtz stops and stares at Erin. “What?” She says in complete confusion. “I mean… I know we haven’t really talked about the future, but I always kind of hoped I’d be married and have kids one day and lately…” Erin bites her lip and looks away, blushing. “Kids? With- with me?” Holtz manages, as she seems to be struggling to take in enough air. “I mean- only if you want to. Just an idea. You know what? Forget I said anything,” Erin mumbles as she starts to walk again, but Holtz is rooted in place. She’s thirty-two and Jillian again, she’s still Holtzmann, but there’s another Holtzmann now – a Gilbert-Holtzmann, technically. She holds her daughter in her arms and sings quietly to her as she fusses. Ten fingers, ten toes, a mess of brown curls, bright blue eyes and all the loudness and dramatics to match her mama’s. She understands her mother’s song better now. She thought she got it before, but here and now, she really understands. And now it’s a tradition she gets to pass on. It’s a weird Holtzmann tradition, which makes it even better. She looks with pride at her sleeping wife – HER WIFE, she still can’t believe it. Erin deserves to sleep for weeks, she’d been in labour for what felt like weeks, anyway. It was her own fault; Erin had very haughtily won the coin toss last year, so she had called dibs on being alpha mom. Jillian carefully crawls back into the hospital bed, her wife in one arm and their daughter now snoozing on her chest. Erin curls closer to her in her sleep and their daughter gurgles as Jillian hums soft hallelujahs. Every time she looks, she can’t seem to avoid beaming with joy at this little person she helped make: Katherine Gilbert-Holtzmann. A little bit after Cat and little bit all her own. She supposes it might be a bit morbid to kinda name a kid after their aunt who only lived for a few hours, but she’s a Ghostbuster baby, she can handle some ghosts. She stands in front of the stones with her name on it. And that’s it! Holy heck!